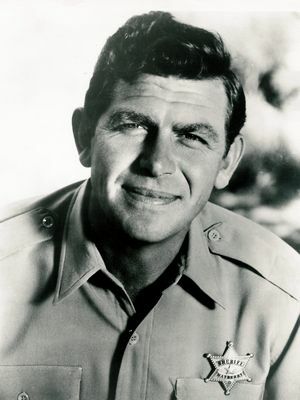 MOUNT AIRY, N.C. - The Andy Griffith Museum, home to the world's largest collection of Andy Griffith memorabilia, continues to attract fans from all over the world. "We get folks from all 50 states and 47 countries," said curator Emmett Forrest, a schoolmate and friend of Griffith who spent 25 years assembling the collection. People flocked to the museum in its first 12 months, which moved to its permanent home Nov. 6, 2009, after being housed in various spots throughout Mount Airy for several years. Forrest says the largest draws are the iconic "Sherriff" and "Justice of the Peace" signs that graced the courthouse doors on The Andy Griffith Show, along with the salt-and-pepper suit worn by Deputy Barney Fife for special occasions and on dates with girlfriend Thelma Lou. "Another item that gets a lot of attention is the set of jailhouse keys," Forrest said. "Those keys make everybody smile because they can see Otis, the lovable town drunk, reaching from his cell to pick them up and let himself out of jail. We also have Otis's jacket and hat." The museum received a boost in August when George Lindsey, who played Goober Pyle on The Andy Griffith Show, donated Goober's pin-striped suit and mechanic's beanie, which Lindsey had bronzed years ago. A bonus is the opportunity to meet actress Betty Lynn, who played Thelma Lou on the show. She appears at the museum on the third Friday of each month to chat with fans and sign autographed photos.